I have been sorely neglecting my blog again, but not my art making… here’s a little update on what I’ve been up to! I finally made a website for my art portfolio! Indexhibit is the best and after one harrowing evening of setting up a database on my web host I have a site I can be proud of. It is still quite basic and bare bones, but I hope to amp it up in the coming months. Curated by the wonderful Woman King Collective, this show brings together 10 Canadian female artists and designers to answer the question “What would you do if only once every four years you could break any rule for just one day alone?”. The exhibition runs from February 27th to March 10th at The Department, 1389 Dundas St. West. 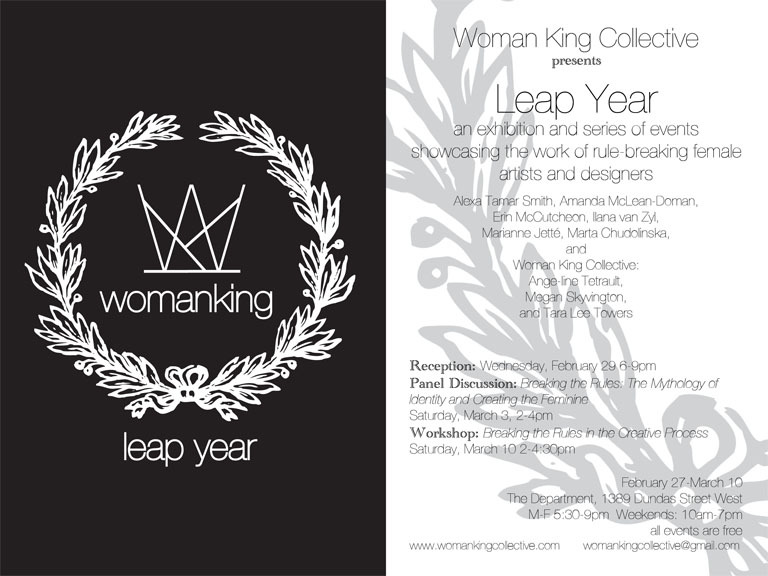 The opening reception is on February 29th (leap!). I will be participating in a panel discussion on Saturday March 3rd, 2-4pm, called “Breaking the Rules: The Mythology of Identity and Creating the Feminine.” There will also be a workshop the following weekend, which I unfortunately cannot attend (more on that below). All events are free. If you are considering coming but feel unsure, know that one of the pieces in the show invites the audience to smash stuff… hesitations out the window! Smash! If Chicago is the place you call home, come out and visit my table at the Chicago Zine Fest! I will be selling a variety of wares (zines, books, posters and prints). There are several events at the Fest but you can find me at the ZINE EXHIBITION, Conaway Center (1st & 8th Floor), Columbia College, 1104 S Wabash Ave, running from 11am to 6pm. I will be on the first floor with a few awesome Toronto peeps at my side. Finally, on Wednesday March 14th, I will be celebrating the launch of Story of Our Lives, the third issue of Static Zine. Static is a collective lifestyle and arts DIY magazine run out of Toronto. I have contributed a wee comic and I’m so excited to see what everyone else has come up with! The launch is happening at the Rivoli from 7pm to 1am and will feature some super bands, including the Ruby Spirit.